January 1-15 average temperatures generally ranged from near normal to more than 6°F above normal. 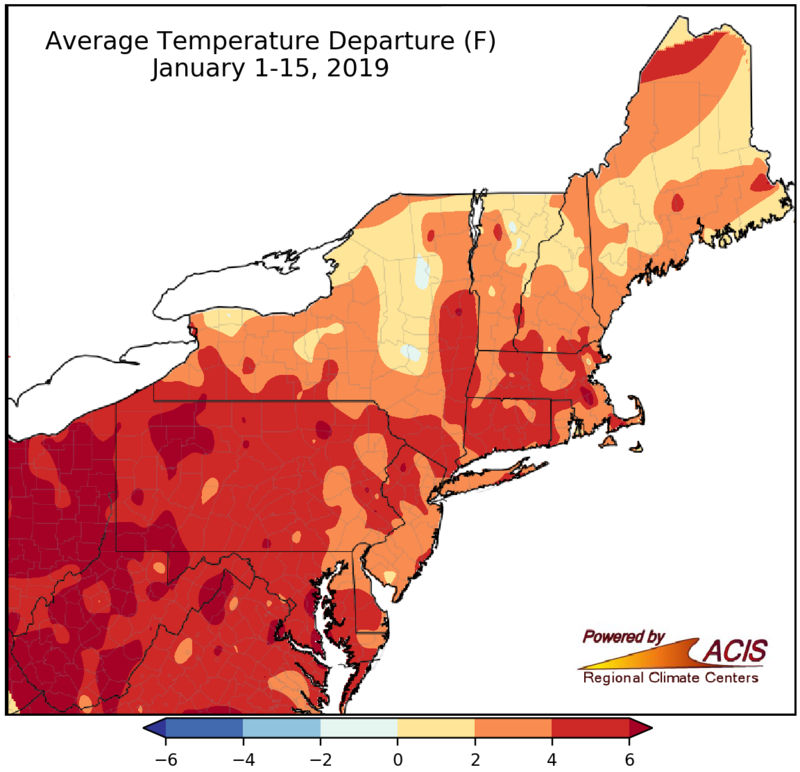 The first half of January was warmer than normal for the Northeast, with average temperatures ranging from near normal to more than 6°F above normal. The warmest areas tended to be in western Pennsylvania, West Virginia, and Maryland. All 35 major climate sites experienced above-normal temperatures, as well. Four major climate sites ranked this first half of January among their 20 warmest on record. Winter-to-date average temperatures ranged from near normal to 6°F above normal for most areas. 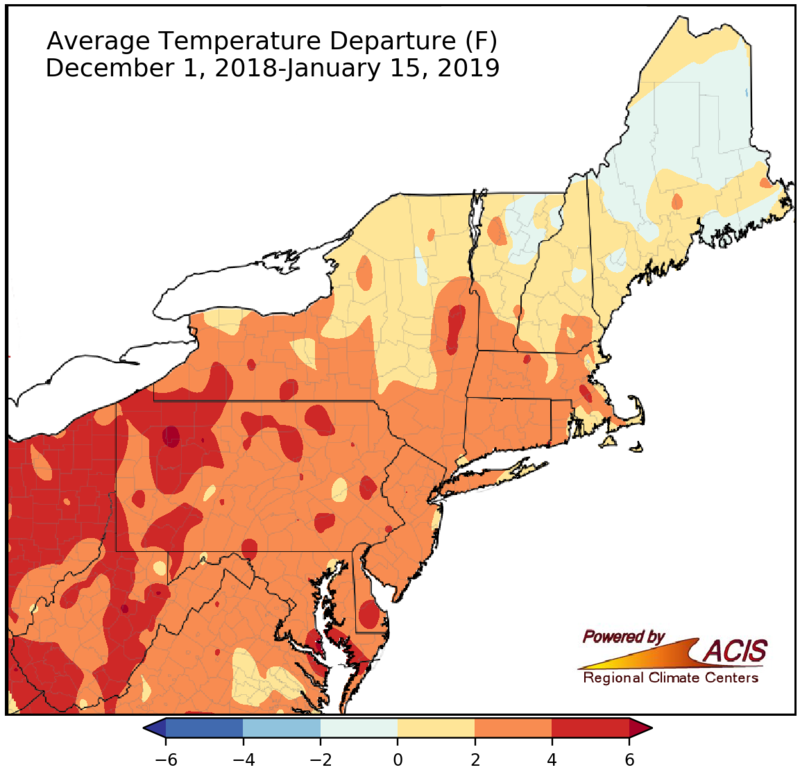 The winter season so far has also been warmer than normal for a majority of the Northeast, with average temperatures ranging from near normal to 6°F above normal. The main exceptions were parts of northern New England, where temperatures were as much as 2°F colder than normal. Thirty-four of the 35 major climate sites experienced warmer-than-normal temperatures, with 10 ranking this first half of winter among their 20 warmest on record. All but one major climate site was warmer than normal for the December 1, 2018-January 15, 2019 period. 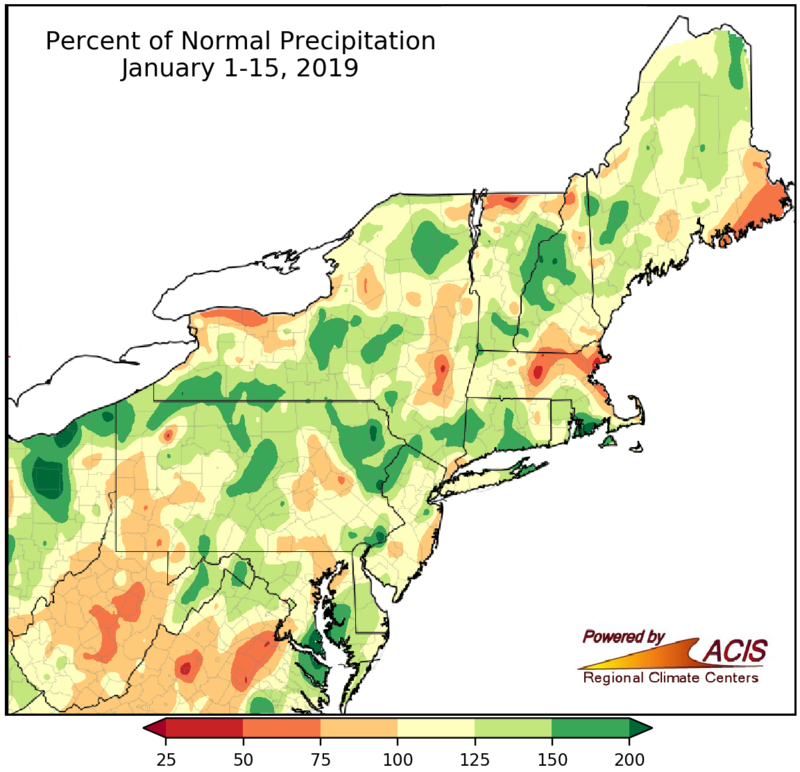 During the first half of January, the driest areas (shaded dark orange) received 50-75% of normal precipitation, while the wettest areas (shaded medium green) received 150-200% of normal. Precipitation varied during the first two weeks of January, ranging from 50% of normal to 200% of normal. Thirty of the region’s 35 major climate sites were drier than normal, with five ranking this January 1-15 period among their 20 driest. However, Caribou, ME, recorded its 19th wettest first half of January. 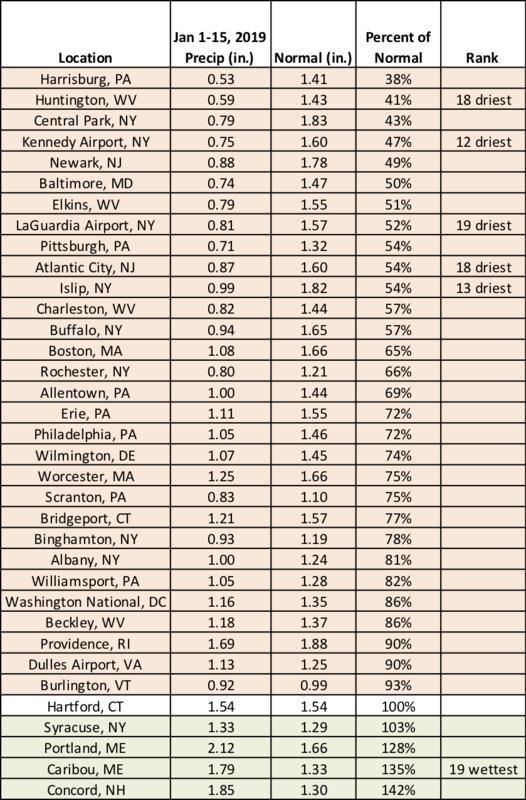 January 1-15 precipitation at the major climate sites ranged from 38% of normal in Harrisburg, PA, to 142% of normal in Concord, NH. Mid-winter precipitation ranged from 50% of normal to 200% of normal. Winter-to-date was wetter than normal for a large portion of the Northeast. 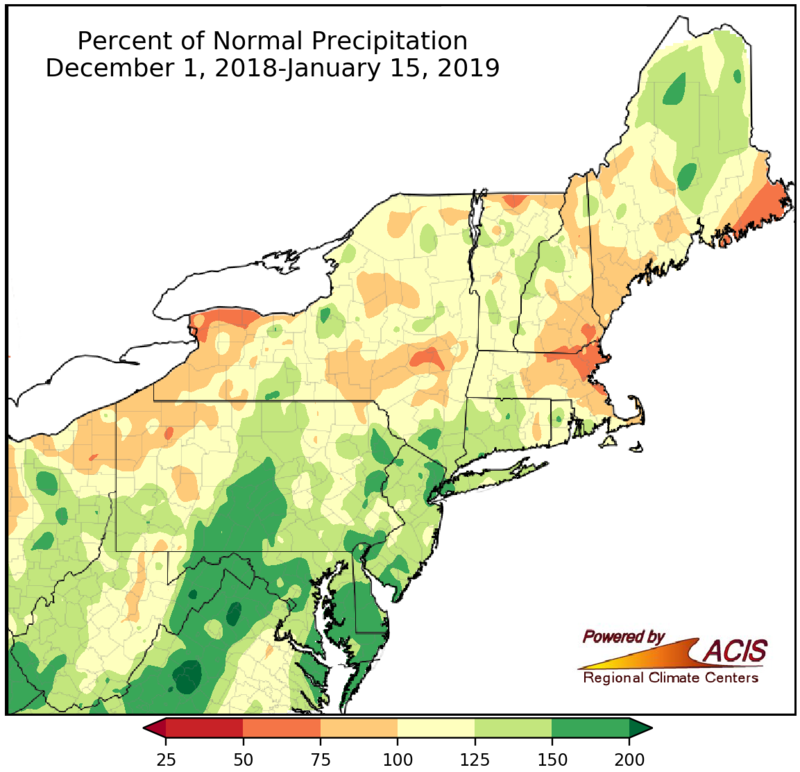 The wettest areas, which were generally in Pennsylvania, the Mid-Atlantic, and the New York City metro area, received 150-200% of normal precipitation. Twenty-eight of the 35 major climate sites were wetter than normal, with 13 ranking this first half of winter among their 20 wettest. However, some areas in upstate New York and New England were drier, seeing less than 75% of normal precipitation. Thirteen major climate sites ranked this first half of winter among their 20 wettest on record. January 1-15 snowfall ranged from more than 12 inches below normal to more than 12 inches above normal. 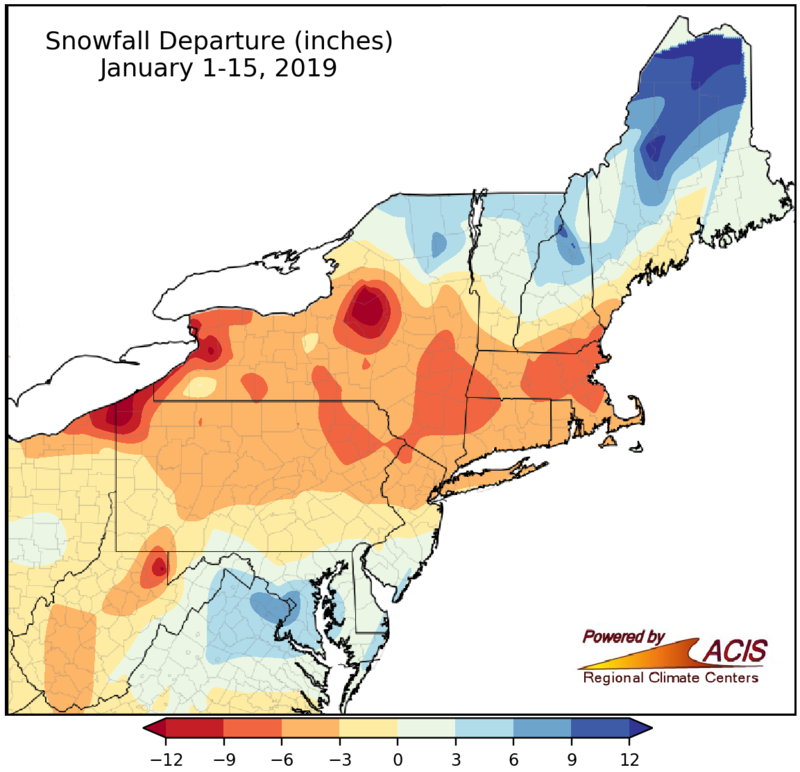 Snowfall also varied across the region during the first half of January, ranging from more than 12 inches below normal in lake-effect prone areas of New York and Pennsylvania to more than 12 inches above normal in northern Maine. 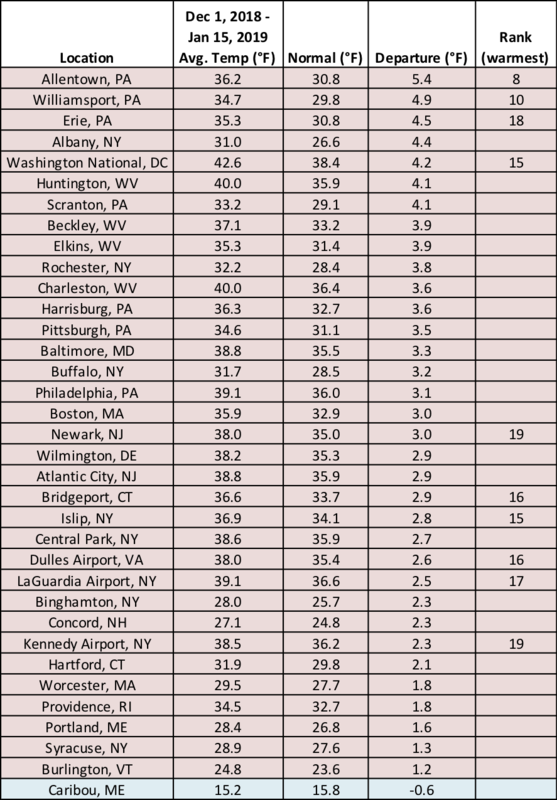 Twenty-eight of the 35 major climate sites had a snowfall deficit, with 16 of those sites ranking this January 1-15 period among their 20 least snowy on record. Conversely, of the seven sites receiving a snowfall surplus, five ranked the period among their 20 snowiest. Sixteen major climate sites ranked this January 1-15 period among their 20 least snowy on record, while five ranked the period among their 20 snowiest. 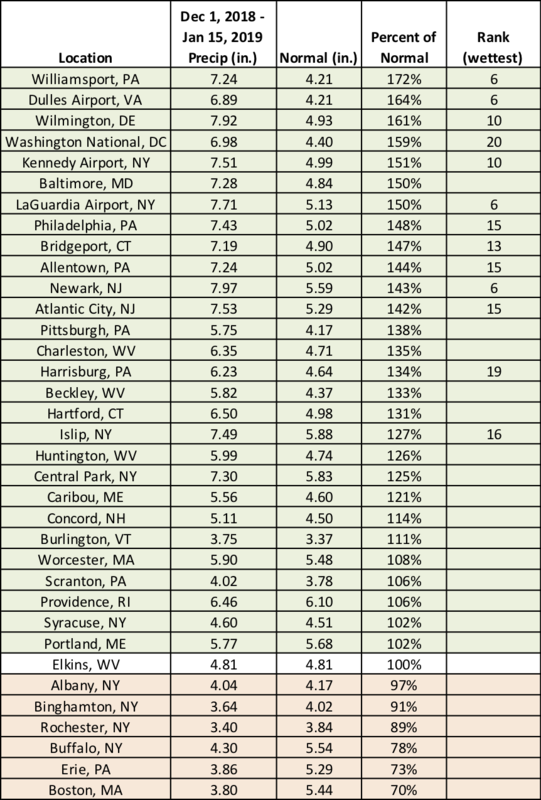 For a majority of the Northeast, mid-winter snowfall ranged from 24 inches below normal to within six inches normal. 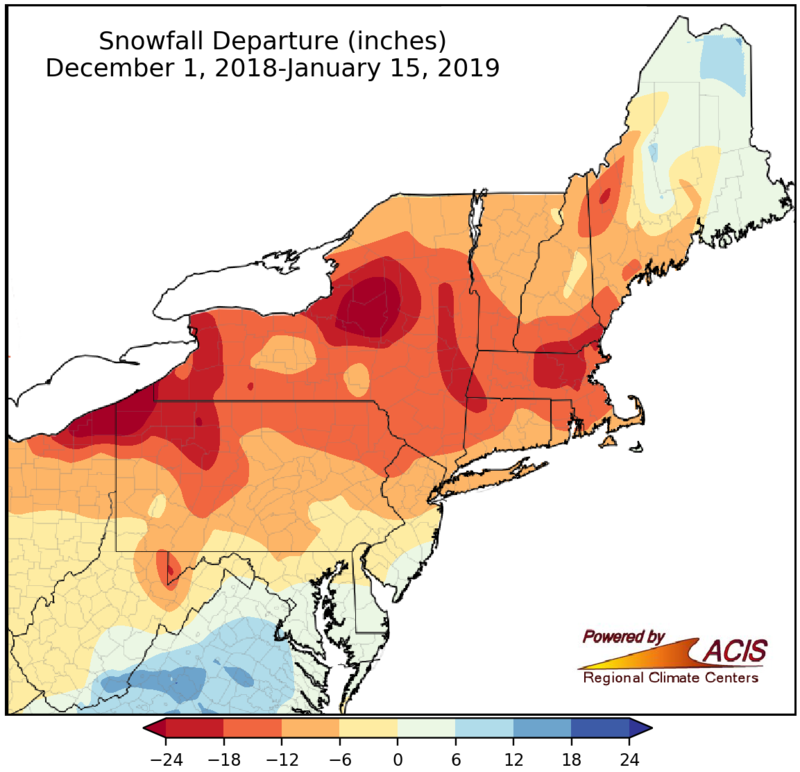 Expanding out to look at winter-to-date, snowfall was lacking for much of the Northeast. 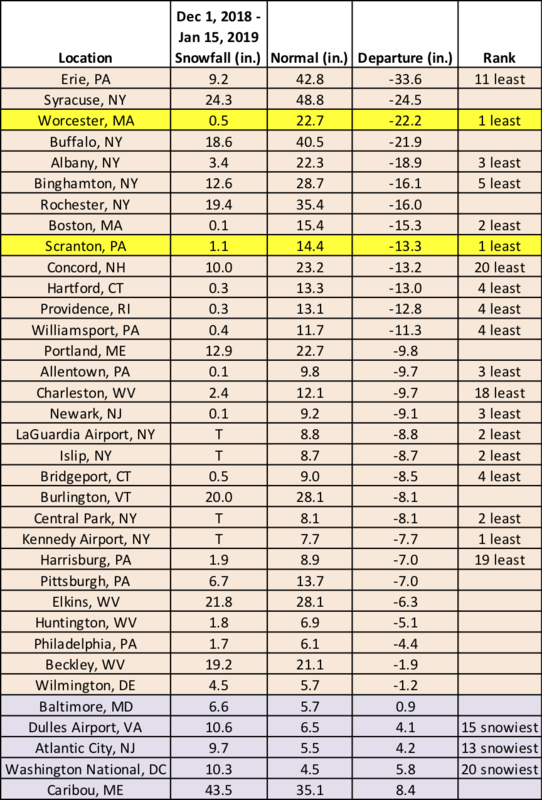 The largest deficits of more than 24 inches were in lake-effect prone areas of New York and Pennsylvania. Of the 30 snowier-than-normal major climate sites, 19 ranked this first half of winter among their 20 least snowy on record. 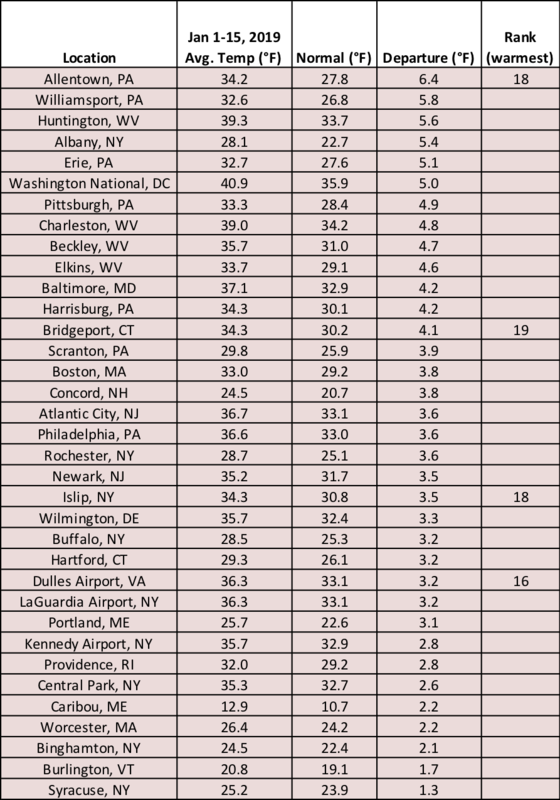 In fact, it was the least snowy first half of winter on record for Worcester, MA, and Scranton, PA. However, a few sites had a snowfall surplus, with three major climate sites ranking this first half of winter among their 20 snowiest. 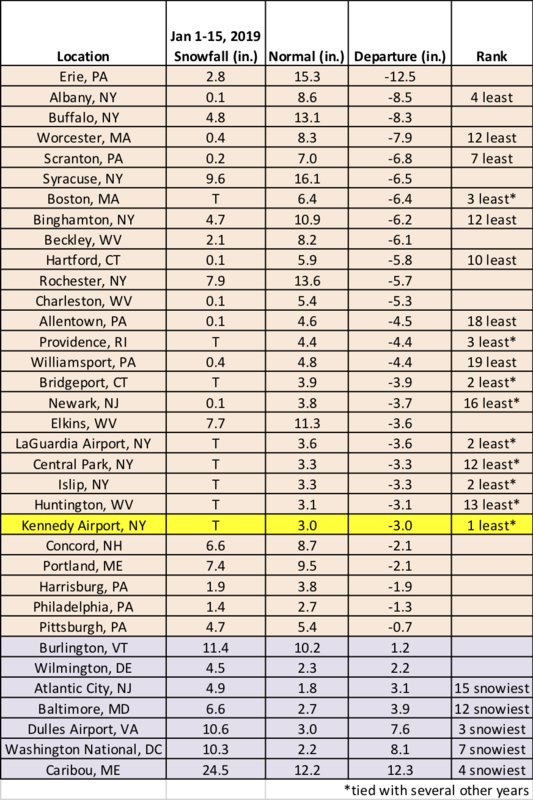 Worcester, MA, and Scranton, PA, had their least snowy first half of winter on record. The rest of January looks to potentially be colder and wetter than normal, according to the Climate Prediction Center’s 6-10 and 8-14 day outlooks. Those outlooks show an increased likelihood of below-normal temperatures and above-normal precipitation for the January 21-29 period. In addition, portions of the Northeast could experience a major snow storm over the upcoming holiday weekend. Details are still uncertain, so please consult your local National Weather Service office for more information.